27/03/2019: The most authentic and delicious Peruvian experience outside of Peru! Incredible food, amazing atmosphere, brilliant staff. 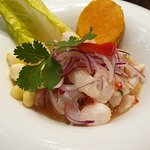 The Ceviche is as perfect as you'd find on a cultural foodie tour of Lima! We flew over from Dublin to eat here, that's how good it is! 10/10 we'll be back again and again!